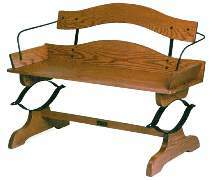 Home > Buckboard Bench Plan & Parts Kit by The Roudebush Co.
Buckboard Bench Plan & Parts Kit by The Roudebush Co. This full size replica of a buckboard bench is authentically designed with real steel springs. Bench sits two adults comfortably and is a great project for your home or patio. This package includes the project plan as well as the seat springs, steel backrails, steel arms and attachment hardware. The wood and wood finish are not included. Note: This item is drop-shipped. Please allow 4 to 6 weeks for delivery.